ATLANTA (AP) — Just five games into his tenure as Atlanta United's coach, Frank de Boer is already feeling the heat. The reigning MLS Cup winners unveiled a championship banner before their home opener Sunday, but it was merely the prelude to another disappointing performance. Roland Lamah scored in the 86th minute to give expansion FC Cincinnati its historic first point with a 1-1 draw. At the final whistle, United actually heard boos from the announced crowd of 70,382 at Mercedes-Benz Stadium — a stunning development for a team that has been feted with record fan support during its first two seasons and captured the second major title in the city's largely tortured pro sports history less than four months ago, earning a parade through the streets of downtown Atlanta. "I don't think it's fair," de Boer said, when asked about the fan reaction. "Everybody works very hard. It's not that they didn't give 100 percent." Josef Martinez scored an early goal but Atlanta's lead didn't stand up. Once again, United turned in a largely uninspiring performance out of de Boer's 3-4-3 alignment, which seems ill-suited to aa team that had one of the MLS' most dynamic offenses under previous coach Tata Martino. 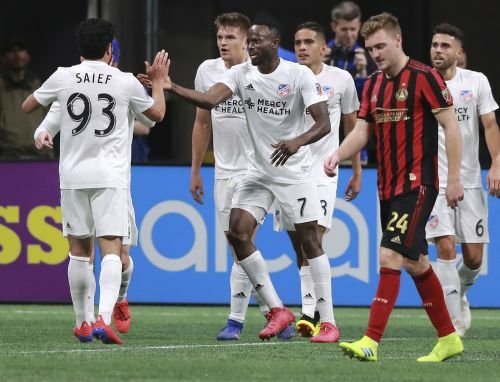 Atlanta opened the MLS season last weekend with a 2-0 loss at D.C. United, which was followed by a 3-0 blowout at Monterrey in the opening leg of the CONCACAF Champions League quarterfinals. The return leg is Wednesday at Mercedes-Benz Stadium, but no one gives United much of a chance to turn around that daunting deficit. At this point, Atlanta is merely looking for signs of hope. "It's been a tough few weeks for us," goalkeeper Brad Guzan said. "Today feels like a loss. Last year, we weren't using to losing. It wasn't in our DNA." De Boer faced a daunting task when he took over in Atlanta, replacing a hugely popular coach who made all the right moves in the club's first two years of existence and satisfying a fan base that has drawn worldwide attention for its rabid support. The start of de Boer's tenure couldn't have gone much worse — especially considering he lasted mere months in his last two coaching jobs. He was fired after only 85 days by Inter Milan in Italy's Serie A, followed by a dismal, 10-week stint at the Premier League's Crystal Palace. In its first five games with Atlanta United, de Boer is 1-3-1. The team has been shut out twice and held to one goal in two other games — hardly looking like the dynamic team that averaged more than two goals per match over its first two MLS seasons. "We are now the hunted," de Boer said. "That's a different approach. Everyone has to learn from that." After hearing plenty of cheers during a pregame ceremony honoring the team's championship season, Atlanta got off to a rousing start. In the fifth minute, Julian Gressel sent a pass through two defenders to Martinez breaking into the clear. The reigning MLS MVP, who scored a record 31 league goals in 2018, sauntered in all alone on goalkeeper Spencer Richey, launching a shot over his left shoulder. Turns out, that was one of the few good chances created by United. Cincinnati, coming off a 4-1 loss at Seattle in its debut game, was much competitive in this one. In fact, it appeared to pick up the tying goal in the 56th when Fanendo Adi headed one past Guzan, only to have it nullified because Lamah was lingering offside away from the play. Lamah made up for his mistake in the closing minutes. Taking a long pass from Kenny Saief, Lamah raced into the area uncontested and blasted a low shot beneath Guzan's left leg to give Cincinnati its first MLS point. "I thought the game was going to end about 5 or 6-0," said Cincinnati's Greg Garza, who played the last two seasons in Atlanta. "I'm glad we were able to change it around, I'm glad we were able to get more energy as the game went on. We started to grow some confidence and, to be honest, I think we could have really changed the game if we had more time." Garza received a big ovation when he came on in the 71st minute — one of the times the Atlanta crowd had reason to cheer. "It is tough to see my old teammates going through a pretty tough time right now," he said. Lamah's tally was the only shot on goal by Cincinnati, which was outshot 10-4 overall. "Everybody is very disappointed with the result," de Boer said. "Sometimes you don't play your best, but you have to win those games to get the confidence."